The Secret Keeper is published by Allen & Unwin and is due for release in Australia and New Zealand in November, but is already available in the UK and US. 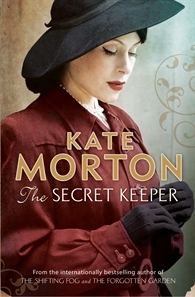 And click the link below to see Kate Morton’s take on finishing The Secret Keeper! For a chance to win one of 4 copies of this brilliant book, be sure to comment on my blog over the coming weeks. During the next month I’ll be sharing my experiences as I take part in my 5th Nanowrimo, (my 7th if you count Camp Nano!! ), novelling alongside my son who is taking part in the Nanowrimo Young Writer’s Program. I’ll be giving away 1 book each week to a random commenter from that week. So come say hello, and tell me all about your own writing and/or reading experiences.